Recent studies have described lipid peroxidation to be an early and sensitive consequence of cadmium exposure, and free radical scavengers and antioxidants have been reported to attenuate cadmium-induced toxicity. These observations suggest that cadmium produces reactive oxygen species that may mediate many of the untoward effects of cadmium. 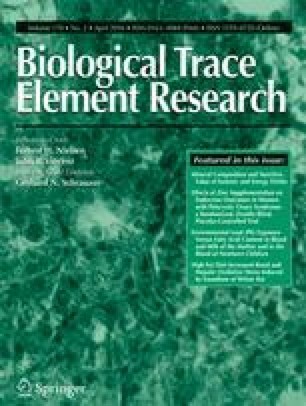 Therefore, the effects of cadmium (II) chloride on reactive oxygen species production were examined following a single oral exposure (0.50 LD50) by assessing hepatic mitochondrial and microsomal lipid peroxidation, glutathione content in the liver, excretion of urinary lipid metabolites, and the incidence of hepatic nuclear DNA damage. Increases in lipid peroxidation of 4.0- and 4.2-fold occurred in hepatic mitochondria and microsomes, respectively, 48 h after the oral administration of 44 mg cadmium (II) chloride/kg, while a 65% decrease in glutathione content was observed in the liver. The urinary excretion of malondialdehyde (MDA), formaldehyde (FA), acetaldehyde (ACT), and acetone (ACON) were determined at 0–96 h after Cd administration. Between 48 and 72 h posttreatment maximal excretion of the four urinary lipid metabolites was observed with increases of 2.2- to 3.6-fold in cadmium (II) chloride-treated rats. Increases in DNA single-strand breaks of 1.7-fold were observed 48 h after administration of cadmium. These results support the hypothesis that cadmium induces production of reactive oxygen species, which may contribute to the tissue-damaging effects of this metal ion.